Up til now, MegaCon has been the premiere fan convention in Orlando, but now word comes that Wizard World will bring their Comic Con experience to the city in August 2016. Wizard World Comic Con Orlando will run August 5 through 7 at the Orange County Convention Center. Wizard World is known for contracting celebrity guests to appear at more than one convention so they get a lot of big names in the fandom genres, and has a pretty good reputation for being fan friendly and well-run. I personally haven’t attended one, but I will definitely check out this one in Orlando. On Tuesday, June 9, the Leonardo Da Vinci and Titanic attractions in Orlando will band together for a day of fun history. Start your journey at 10am by learning about Da Vinci and his creative inventions and art, then embark on an ill-fated cruise aboard the legendary ship Titanic. 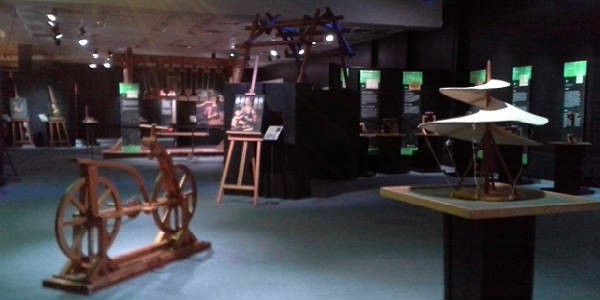 Special program activities will help bring the stories to life with hands-on learning and fun. 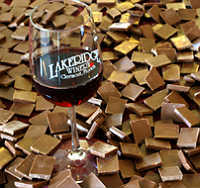 The weekend of December 8 and 9, 2012, Lakeridge Winerywill be holding their Wine and Chocolate Festival. In addition to celebrating the pairing of wine with chocolate, the weekend will groove to the sounds of live music on the outdoor stage. The Ladyz & The Boyz, Robert Harris, and The Nightly Blues Band will perform on Saturday; BlueStone, Marc Clermont, and Beautiful Bobby Blackmon & the B3 Blues Band will perform on Sunday. There will be food and drink (both alcoholic and non-alcoholic) for purchase. You can also do the vineyard tour. Event hours are 10am-5pm on December 8 , and 11am-5pm on December 9. A $2.00 donation per person will be accepted at the gate to help benefit the American Heart Association. Lakeridge Winery is located at 19239 US 27 North in Clermont, FL. Phone is 800-768-9463. 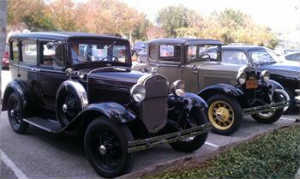 The weekend of October 6 and 7, 2012, Lakeridge Winery will be holding their Vintage Venture event. Vintage cars will be on display all weekend, accompanied by the sounds of classic 50’s and 60’s music. Performers are Marc Clermont and Johnny DeRose on Saturday, and The Ladyz and the Boyz and Johnny DeRose on Sunday. 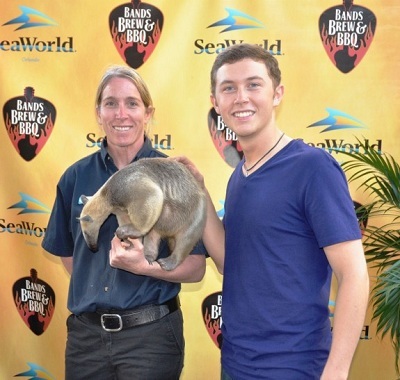 Event hours are 10am-5pm on August 18, and 11am-5pm on August 19. A $2.00 donation per person will be accepted at the gate to help benefit The Mustard Seed of Central Florida. 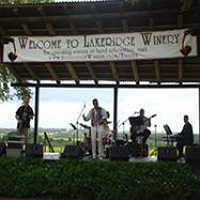 The weekend of September 15 and 16, 2012, Lakeridge Winery will be holding their Jazz at the Winery event. As the name implies, the weekend will groove to the sounds of live jazz, performed by Airtight and Tory Wynter on Saturday, and The Dave Capp Project and The Robert Harris Group on Sunday. Event hours are 10am-5pm on September 15, and 11am-5pm on September 16. A $2.00 donation per person will be accepted at the gate to help benefit a local charity. Lakeridge Winery is one of the hidden gems in the Orlando area. People can visit and take tours of the vineyard, as well as sample their wines. This weekend, is one of the best reasons to visit the winery. It’s time for the annual Harvest Grape Stomp festival. 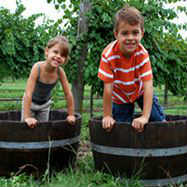 There will be grape stomping competitions – yes, in the barrels – with prizes for the best efforts. Kids of all ages have fun doing this. There will also be live music both days. On Saturday, enjoy The Groovemasters and Robert Harris (both solo and with group). Sunday gets bluesy with The Nightly Blues Band and Beautiful Bobby Blackmon & the B3 Blues Band. Event hours are 10am-5pm on August 18, and 11am-5pm on August 19. Cost is $2 per person and all ages are welcome. Lakeridge Wineryis located at 19239 US 27 North in Clermont, FL. Phone is 800-768-9463. I admit it. I’m a huge Star Wars fan. I’ve seen every movie (including the first) on opening weekend. I own memorabilia ranging from posters to trading cards. Well, you get the idea. So you can imagine my joy at hearing that the Star Wars Celebration convention would be returning to Orlando this year. The last one was also held here in 2010, and I had a great time covering it. 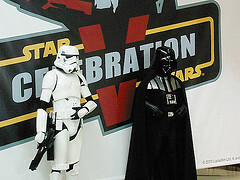 This will be the sixth edition of this convention which attracts Star Wars fans worldwide. Celebration VI is set to roll into the Orange County Convention Center August 23 through 26, and already has a great guest line-up. There’s also a huge merchandise room, where you’ll be able to buy just about anything Star Wars. I have to be honest though. One of my favorite things about the last convention, Celebration V, was seeing the fans who took the time to dress up as their favorite Star Wars characters. If you want to attend Celebration VI, ticket prices for individual day passes are $55 for Thursday, Friday and Sunday and $65 for Saturday for adults, and $27 for kids 12 and under. Save money by buying four-day passes, which are $135 for adults and $54 for kids. 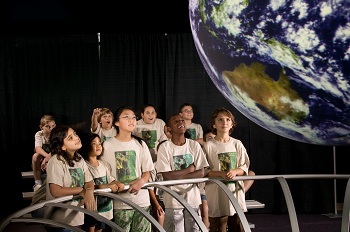 On select Fridays, Saturdays and Sundays from now through June 3, the Orlando Science Center is taking Astronomy Day and stretching it into a month-long celebration during May 2012. Throughout the building, demonstrations that examine gravity, what comets are made of and how space suits work will be taking place. It’s here you’ll find the Science On A Sphere exhibit, which connects guests of all ages to earth and space science through a dramatic visual presentation. Using a six-foot suspended sphere and state-of-the-art projection technology, explore our planet’s dynamic landscape and weather, tour the solar system and understand the complex relationship between our planet and its sister worlds. And be among the first to experience its newest program, Kinesthetic Astronomy, to learn about the four seasons and the rotation of the earth. The aluminum-domed Crosby Observatory atop the Orlando Science Center will be open for SunWatch events during these select weekends. Peer through the powerful, 10-inch lens of one of the largest publicly-accessible refractor telescopes in Florida and safely gaze upon the closest star to our home planet. Grocery store chain Albertsons has announced that it will be closing almost all of its Florida stores, claiming it just can’t turn a profit within the state. This includes 6 stores in Orlando/Central Florida area. Only one store in Altamonte Springs will stay open. Albertsons will only be keeping four stores open statewide. All store closings are expected to happen by mid-June, so check your local location for exact dates and deals. Earlier this month, we did a story on the new Greyhound Express routes to Orlando. Well it seems they’re not the only company bringing cheap bus fares to Orlando. Megabus has opened up an Atlanta hub and is now offering a few Florida routes, including Orlando. Fares start at $1 per connection and sometimes they run specials where a code word will get you a free ticket. As the bus fills up, the fare goes up, so it’s best to book early and if you’re flexible in your travel dates, check the days before and after for lower fares. They also tack on a 50 cent per order transaction fee, but you can’t complain when it’s possible to go round-trip to Atlanta from Orlando for less than $5 if you time it right. Besides low fares, there are other reasons to check out traveling with Megabus, including free wifi and power outlets in each seat. They also have dozens of stops in the Northeast and Midwest. In fact, if you’re creative enough, you could even do a circle tour of states east of the Mississippi. I’ve actually ridden with Megabus and I really liked them. For more information or to price routes, visit Megabus.com. Even though Orlando is a great place to both visit and live, sometimes you want a cheap getaway out of town. If so, you may want to check out the new Florida routes for Greyhound Express. These new destinations connect Orlando with places like Tampa, Jacksonville, and Miami for fares as low as $1 each way. There are even connections to other major East Coast hubs such as Atlanta, Charlotte, and New York City. Even better, these fares don’t just include a reserved seat, but free wifi, power outlets, extra legroom and leather seats. I haven’t had the chance to try them out yet, but it’s worth looking into the next time you want a cheap getaway from Orlando. 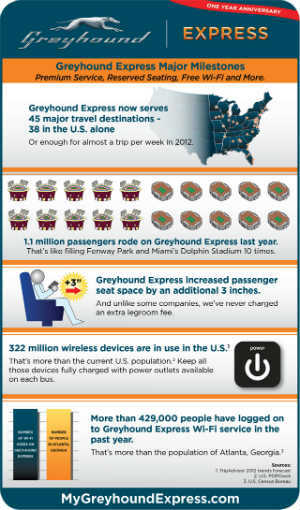 For more information, visit greyhound.com/Express/. 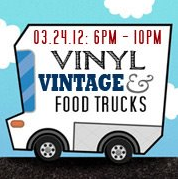 If you like to shop and eat, then you’ll want to save the date of March 24, 2012. This when Park Ave CDs, Dear Prudence Shop and the Audubon Park Garden District are holding the next installment of Vinyl, Vintage & Food Trucks. The event runs from 6pm-10pm and there will be used vinyl, vintage jewelry, clothing, and more for sale and trade. Interested in being a vendor? Stop by Park Ave CDs for an application. Food trucks signed up to appear include Big Wheel Provisions, Swede Dish Truck, Fish out of Water, Cafe Rouge Express, The Crepe Company and La Empanada. 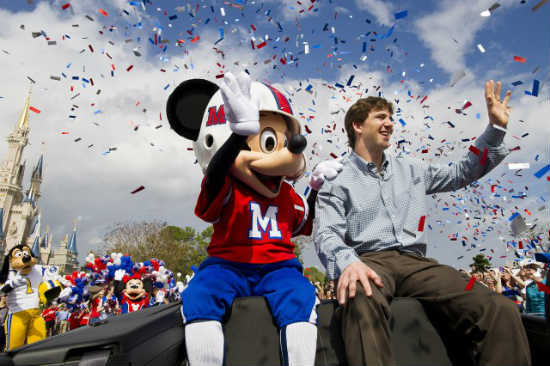 Monday morning, he did just that, riding in a ticker tape parade down Main Street U.S.A. at the Magic Kingdom with Mickey Mouse. 2012 is a leap year, meaning we get one extra day on the calendar. 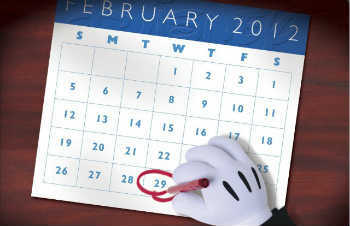 This year that extra day is going to be when a special promotion takes place at Walt Disney World. On February 29, 2012 – for the first time ever – WDW will keep the Magic Kingdom park open a full 24 hours. From 6am on Feb 29 through 6am on March 1, guests will be able to enjoy playing in the Magic Kingdom non-stop. To make things even better, this is not a special ticket event. Any regular Disney admission from single park tickets to annual passes will get you in for this. I’m already making plans to be out there for the overnight. Anybody else planning on taking advantage of this special promotion?